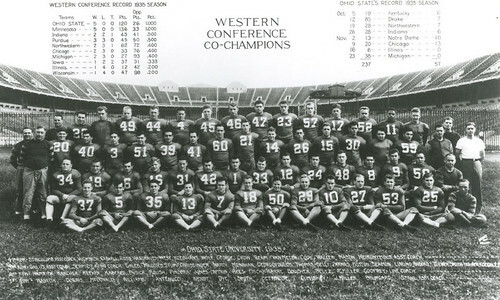 We are now out of the 30s and into the roaring 20s as we get another day closer to the start of Ohio State football. Below you will find a list of the 33 players who have worn No. 29 for Ohio State. Today's featured players are Inwood Smith and Pepe Pearson. An interesting note on Inwood Smith is that he placed third in the Discus Throw at the 1935 NCAA Men's Track and Field Championships. Some guy named Jesse Owens won the Broad Jump, 100-Yard Dash, 220-Yard Dash and the 220-Yard Low Hurdles at the same event. The Buckeyes were 19-5 with Smith on the team. Smith went 3-0 against That Team outscoring them 99-0. (Smith) was an All-American football player for the Ohio State University Buckeyes in the mid-1930s. A native of New Jersey, he moved with his family to Mansfield, Ohio as a boy. In addition to football, Smith was a competitive swimmer, basketball player, and track and field athlete. At the end of the 1935 college football season, Smith was selected as a first-team All-American by Grantland Rice for Collier's Weekly and by a board of coaches for Pathé News. After graduating from Ohio State, Smith was employed by the Westinghouse Electric Manufacturing Co. in Grand Rapids, Michigan, and Cleveland. During World War II, Smith became district supervisor of the Office of Price Administration in Columbus, Ohio. The Buckeyes were 41-10 with Pearson on the team. 1997 Defeated No. 4 Arizona State 20-17 to win the Rose Bowl. Defeated Notre Dame in 1995 (45-26) and 1996 (29-16). 1996 Defeated No. 4 Penn State 38-7 in Columbus. Pearson is third all-time at Ohio State with 659 rushing attempts. Pepe ran for over at least 100 yards 13 times in his career. 5-10, 206...from Euclid, Ohio...Will be in his second year as the Buckeyes' starting tailback...ran for 1,443 yards and 17 touchdowns last year...both totals led the team and his yardage figure ranks as the sixth best one-season figure in Ohio State history...finished third in the Big Ten and 11th nationally in rushing yards per game with an average of 124.8 (based on regular season games only). Has been timed electronically at :04.4 in the forty-yard dash, the best time ever by an OSU back...also has the raw power to run inside...ranks 11th on the all-time Ohio State rushing list with 2,166 yards, but can leap frog into third place by equalling his out of last year...stronger "mentally and physically" than he was a year ago and much more confident. A USA Today All-American at Euclid High School...rushed for 1,500 yards as a senior and for over 4,300 during his prep career...led Euclid to an 11-1 record as a senior...from the same high school that produced Buckeye standout and current Minnesota Vikings running back Robert Smith. A four-year letterwinner at Ohio State, Pearson is the Buckeye’s ninth all-time leading rusher (3,121 yards) as of 2008, trailing only Archie Griffin, Tim Spencer, Keith Byars, Eddie George, Beanie Wells, Carlos Hyde, Braxton Miller and Ezekiel Elliott. His 1,484 rushing yards as a junior is the tenth highest season total in team history. With 17 touchdowns, Pearson is eleventh on the Buckeyes' scoring list. Pearson's had a 173-yard rushing performance in Ohio State's 1996 victory over Notre Dame. After his playing career ended, Pearson began a career in coaching. From 2004-2015 he was the running backs coach for Ohio Dominican University. In 2005, he was also the head coach of the Daytona Beach Hawgs of the NIFL, leading them to a playoff berth just before the team was disbanded. He was also the head coach for the now defunct Marion Mayhem of the Continental Indoor Football League (CIFL). In 2015, he joined Bo Pelini at Youngstown State to be their running backs coach, having a successful first year with his team accumulating more than 2,000 rushing yards. In 2016, he left Youngstown and joined Marshall in Huntington, WV. 112 days until The Game.